Other teams' traditions of turning the Horns upside down and tossing tortillas is just "extra noise" for the Texas Longhorns. AUSTIN — When the late UT cheerleader Harley Clark initiated the “Hook ‘Em Horns” hand sign in 1955, I’m sure not one person envisioned that opposing teams and fans would eventually turn it upside down. The Longhorns’ junior receiver isn’t the only one on the team who is passionate about their hand sign. "I remember every single team/player that disrespects the rich tradition of the University of Texas by putting the Horns down. Do not think it will be forgotten in the future." 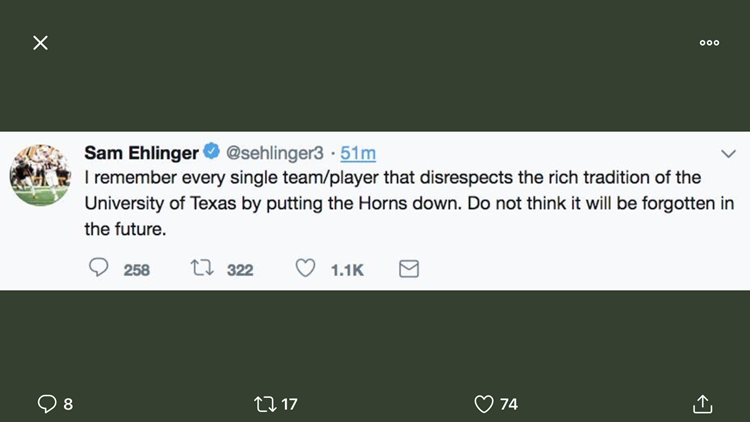 That is a copy of Sam Ehlinger’s tweet from Sunday. The Texas quarterback has since deleted that tweet and has removed the Twitter app from his phone. Ehlinger and the Longhorns witnessed West Virginia display their upside down Horns hand signs often in Austin last Saturday during and after the Mountaineers' 42-41 win. “It’s extra noise and it gives people voices who don’t necessarily matter,” said Ehlinger on Tuesday. The upside down Horns hand sign is nothing new. Programs and fans from opposing teams have done it for decades. “If we take care of our business, we don’t have to worry about that,” said Ehlinger. I respect that and agree with that statement. Maybe it’s offensive to some or a distraction, but worthy of a penalty? That’s debatable. Just like those traditional flying projectiles that Texas Tech fans eject into the air towards the visiting teams in Lubbock. “If you’re too worried about tortillas and environment, and whatever the hell else they’re doing, then you’re wasting your time,” said Texas defensive end Charles Omenihu. The Longhorns travel to Texas Tech on Saturday. Kickoff is at 6:30 p.m. Texas is currently 4-2 in Big 12 play and 6-3 overall.